The Post Office has sent account details to the wrong customers after a mistake in printing statements. It has apologised after the details of about 120 pensioners' accounts were mixed up during the printing of 5,500 letters sent out last month. The Post Office rejected suggestions that 5,500 had been affected but has informed anybody who may be involved. The incident was revealed in an advisory memo sent in the Department for Work and Pensions. The memo, written by Chris Keogh, an official in the Leeds office of pensions and finance directorate, said: "5,500 POCA customers will be receiving someone else's statements. "The Post Office and its suppliers have apologised for this mistake, customers will be sent their correct statement shortly." The DWP has said that the number of statements that had gone to wrong customers was not 5,500. A Post Office spokesman said an error in a print run of its card account statements resulted in around 120 people receiving some incorrect information. "The Post Office has apologised to anyone who may have received incorrect information and assured them of the strict security procedures in place around the use of the POCA." 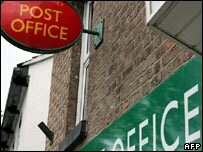 A spokesman for the DWP said the department was just ensuring its staff could inform customers concerned about the Post Office's mistake. He said: "There was no intention to mislead. Our aim was, and is, to ensure customers who contact us for any issue get information they need."